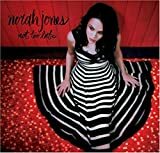 At first, I didn't buy Norah Jones's assertion that her goal with Not Too Late was to focus on developing as a songwriter in the classic sense. Then I heard My Dear Country. A sophisticated torch song in which Jones plays jilted lover to the American electoral-system-slash-government, positioned a little more than halfway through the album, it's smart, well-crafted proof the piano-stroking siren has more in her than just purring sweet nothings. Actually, Not Too Late is a very good showcase for Jones's evolution as a writer and musician, moving past slow, rootsy jazz grooves to embrace sassy Weillian cabaret stompers (Sinkin' Soon), delicate late-night street-corner soul (Thinking About You) and stark country (The Sun Doesn't Like You) midway between Mary Gauthier and the Dixie Chicks. Fine arrangements bolster even the weaker songs here, particularly Lee Alexander's upright bass and Julia Kent's cello on Broken. In fact, the strings throughout are superb, thanks to producer Alexander's choice to leave lots of open space around the instruments in the mix.